Casing, tubing and drill pipe are essential items during the drilling and producing process in the oilfield. 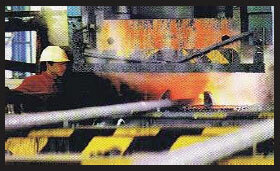 The heat treatment, end upset of smooth pipe, and the machining of the pipe are performed thoroughly according to related API Specifications. The production line, equipped with advanced monitoring instruments can process pipe with the sizes 2 3/8” through 7”. This production line, the end upset equipment working jointly with the heat treatment, is one of the leading technology lines among few manufactures. Seven advanced flow production lines are able to machine 200,000 tons of tubing, casing, couplings, sieve tube, etc with the sizes 2 3/8” through 20” and grades J55, K55, N80, L80, P110 annually.